As Intuit continues to focus on QuickBooks Online, every year people ask me “Is QuickBooks Desktop Dead?” As I’ve done in years past, I’ve taken a look at Intuit’s fiscal year end financial statement for Fiscal Year 2018 to see how QuickBooks Desktop is doing in comparison to QuickBooks Online. Here’s my look at Intuit’s Fiscal Year 2018 information. “QBO” is revenue generated by QuickBooks Online subscriptions. “QBDT” is revenue generated by QuickBooks Desktop subscriptions and unit sales (Pro, Premier, and Enterprise). The columns that add “Attach” is showing the revenue from the QB product and any “attached” revenue, such as payroll subscriptions, fees for QuickBooks Payments, sales of forms, any other kind of revenue that can be associated with that sale or subscription of the accounting product. QuickBooks Desktop revenue, when you include services like payroll and other add-ons that Intuit uses to generate revenue, still is significantly higher than QuickBooks Online revenue with services. QuickBooks Desktop revenue continues to grow. Intuit doesn’t provide a breakdown of this revenue stream, so I can’t say what portion comes from Pro, Premier or Enterprise. There is no doubt that Intuit is focused on developing QuickBooks Online. They’ve been saying that development of online and mobile products is the most important thing for them in the future. However, what this simple look at their financial statements tells me is that QuickBooks Desktop revenue is still an important factor for Intuit, so I don’t see them dropping the product at this time. Great discussion and ‘graphic’ to picture things ‘as they are’. You are still on top of the ball and ahead of the game. Let’s not forget that when potential customers call in – they are only told about QBO (or at least that’s what I’ve been told over the last couple of years). It’s also not quickly (or visually) clear when visiting Intuit websites to find information on desktop either. Good to hear from you, Nancy. As I’ve stated in my articles at Accountex Report, and I allude to here, Intuit’s focus is clearly on the online products. That hasn’t changed, and Intuit believes that it is their future. The growth and strength of the desktop product is both a tribute to the quality of the desktop products as well as an acknowledgement that the online products still have a way to go to catch up (if they ever will). 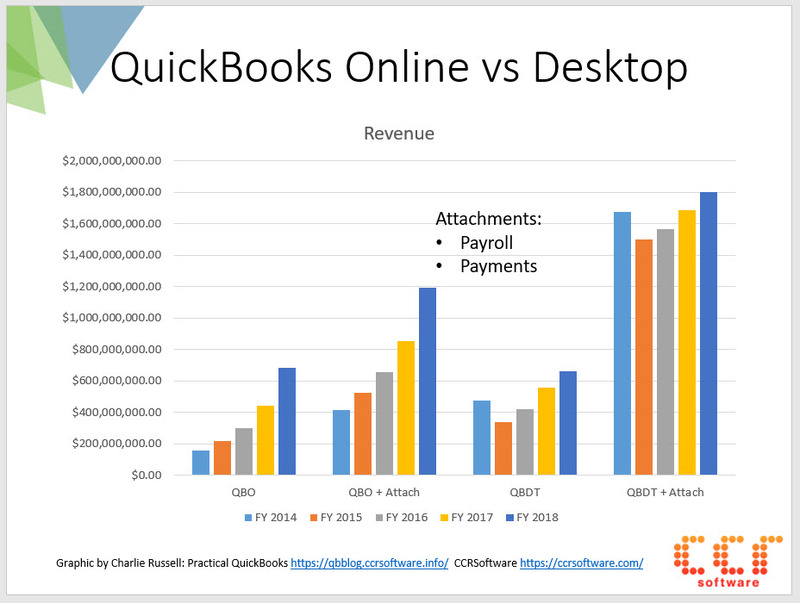 Even though Intuit pushes strongly on QBO, my point is that the revenue from QB Desktop remains strong, so I don’t think that they will just drop it (yet). QBO can compare to QuickBooks Enterprise when it has Enterprise’s features. Is there a market for QBO, yes just like there is a market for Pro and Premier. The addons like Acctivate, Fishbowl and MISys, and Nancy’s company Sunburst Software Solutions make Enterprise even a better option. The news that the Desktop Advanced Certification was going away was very disappointing. It looks like Enterprise is also the Money Maker for Intuit. Thanks for the information. Intuit won’t divulge figures for Pro/Premier separate from Enterprise, at least not clearly, so we can only guess. I suspect that Enterprise is the big driver for desktop revenue, particularly when you consider revenue from attachments. As far as the Desktop Advanced Certification, I believe that very few people have been taking that in the past year or so, which makes it reasonable for Intuit to drop it. Just keep in mind, as I’ve gone into detail in my Accountex Report articles in the past, Intuit firmly believes that “online” and “mobile” is what they need to focus on for the future. We can all talk about how Enterprise is a better product, how QBO can’t compare, but that won’t sway Intuit. The desktop will be around as long as it shows strong revenue, once that drops then I suspect it will be gone. Thanks for the perspective. We still use the two custom programs you built for us that integrate with Enterprise DT for detailed Mfg work instructions for each item and our own custom product label for each item. What keeps us from going to desktop is the loss of these add-on programs. Will Online eventually be able to handle these tasks? Or a third party solution like the one we have now that integrates with Online? Bryan, as it stands now, I seriously doubt that you will be able to get that kind of custom program for QBO. It is very hard to do custom programming with QB Online, at least as far as making it affordable for the developer. I would suggest that you talk to someone who develops with “Method CRM”, which has the possibility of creating some level of custom programming that would work with QBO. I don’t work with Method CRM, so I’m not sure if your custom features could be managed with that.